Choosing FPV antennas is generally the last thing newbie first person view pilots think about; but please don't overlook the importance of these components in your system. 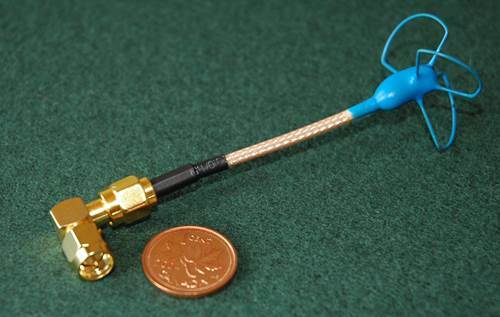 Most start using what comes with most video transmitters and receivers - a simple omni directional linear polarized whip antenna set which, depending on your frequency, can give very poor performance. If you use 5.8GHz, these simple linear antennas are so bad (because high frequency 5.8GHz bounces off stuff so easily causing multi-path interference), I don't even know why they include them with 5.8 GHz video transmitters and receivers? This is really unfortunate because as I mentioned on the FPV RC page, your antennas are the components that will have the largest single impact on your video transmission quality and range so take a little time here to choose the correct one/s. There are essentially 4 main FPV antenna choices you have and you may need to use a different one on your aircraft video transmitter from what you use on your ground station video receiver depending on your specific needs. What FPV antenna (or antenna combination) you decided on really boils down to what frequency you are transmitting on and how far away you want to fly. If you are using higher frequencies in the GHz range which are easily reflected (especially 2.4 & 5.8GHz), those reflected signals as I mentioned, can also easily enter your video receiver antenna causing multi-path video interference. The way around it is to use circular polarized antennas on both your transmitter and receiver. Circular polarization will basically ignore reflected RF so you won't experience nearly as much reflected RF interference. As a newbie, and definitely if you are using 2.4 or 5.8GHz video, I strongly recommend using circular polarized FPV antennas. As I mentioned before, 5.8GHz is so susceptible to reflected signal RF, using the linear polarized whip antenna sets that come with most of these systems are next to useless. I did try it just to see, and could not believe just how poor the image transmission & range was. So now you have decided on the polarization type - what is this directional and omni directional stuff all about? It's really is quite simple. Omni directional antennas transmit and listen in all directions. Directional on the other hand (you guessed it), transmit and listen in a specific direction. A satellite receiver dish is a fine example of a highly directional antenna. If you have ever had to re-position your satellite dish when the wind blew it out of adjustment using the signal strength tool bar on your satellite receiver, you know just how directional a dish is - moving it off axis by just 1 degree can take the entire signal out. Now, directional FPV antennas are not nearly that focused (thank goodness), but using a higher gain directional receiver antenna at your ground station is how you greatly improve your range, provided you fly out in front of the antenna and not behind it. 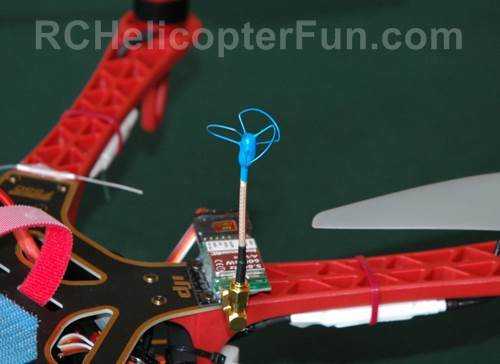 Personally, I feel newbie FPV pilots stay well away from high gain directional receiver antennas when first starting out unless you know for sure you want to get into long range flying. I have no such appetite myself (perfectly happy with 1-2 km's), so I use an omni directional circular polarized receiver antenna and it gives me plenty of range. I like flying all around as well (both out front and behind my location) so for me, a directional would not work (without being hooked to an antenna tracker system or dual diversity receiver), not to mention I just want to have FPV fun and keep it simple (pull the goggles over my head and go flying). You have to decide what type of FPV flying you will be doing and that should give you a very good idea of what antenna set to start with. It is however very easy and inexpensive to get a higher gain directional receiver antenna later on if you feel you want to start extending your range but then you will also have to think about extending your radio system control range if you fly a 2.4 GHz radio system. Again, 2.4 GHz radio systems are only good up to about 2-3 kms and for that kind of range, an omni directional circular polarized video receiver antenna should be quite adequate. I've just been talking about the receiver antenna so far because you have the directional or omni directional choice with it. The transmitter antenna on-board your aircraft however is always going to be omni directional. You want your transmitter antenna to be omni directional for the simple reason your aircraft will be pointed in all different directions/orientations during a flight so you want your antenna transmitting out in all directions. If it was a directional and just pointing out the back end of your aircraft for example, you would have great video range as the aircraft was flying away from you but when you turn around to fly back home and the antenna is now aimed 180 degrees away from you... Yep, bye-bye video! The other FPV antenna choice option I have not mentioned yet (because it's really not a choice at all) is you have to get the correct FPV antenna set for your specific video transmitter & receiver frequency. You can't use a 2.4GHz antenna set for example on a 5.8GHz system. Antennas are specifically "tuned" to each frequency so when you go FPV antenna shopping, make sure you get the correct frequency antennas for your system. The higher the frequency, the smaller the antennas get so if you want to keep things nice and portable, stick with higher frequencies. I'm running 5.8GHz so I am using a 5.8Ghz circular polarized, omni directional antenna set (nice and small). I use Alex's IBCrazy Bluebeam 3 lobe right hand circular polarized clover leaf antenna on my transmitter. By the way, the right hand thing is just referring to the direction of the antenna lobes that cause the RF signal to spiral out and be received in one specific polarized direction. Most are all right hand polarization, but I thought I should mention it if you by chance run across a left hand circular polarized antenna, it won't work with a right hand; both antennas (TX & RX) have to have the same direction of polarization. One other thing I should mention with these circular polarized lobe antennas (IBCrazy's or any other manufacturers) is they are somewhat fragile. The specific lobe angle and spacing plays a roll in how well the antennas are tuned. I didn't realize this at first and the four lobe skew planar wheel I have on my video goggles was getting slightly bent up by my ignorance to this "tuning" fact. As a result, my range was getting worse and worse. I really didn't know what the issue was until I learned the importance of proper lobe positioning and after carefully bending all the lobes back into alignment again, my range was back to normal. It's not overly critical (at least on a good quality and well tuned circular polarized antenna) but it's something to be aware of. Lastly, as I mentioned in the FPV transmitter write-up, the vast majority of these antennas will use SMA coaxial RF connectors to attach them to your transmitter & receiver. 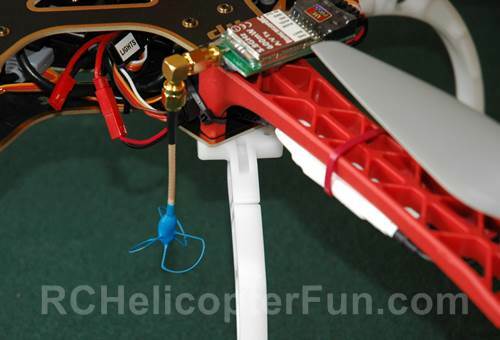 Where you place your transmitter antenna on-board your FPV aircraft is another important consideration for getting the best range and video signal. This will generally require a little experimentation on your part. 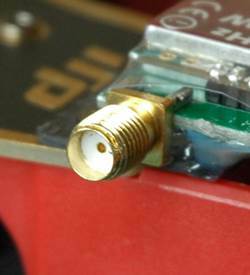 Another golden rule here to start with is to keep your video transmitter antenna as far away from your radio system receiver antenna/s and GPS receiver antenna (if you use GPS) as possible. The next thing to think about is the actual antenna placement position/orientation on the aircraft. For example, when I first started out, I had my video TX cloverleaf sticking up above the F550's top plate. This seemed to work fine until I started getting further and further away. In this position I was only getting about 800 meters away and only 200 meters high. Sometimes even less and when I turned around to fly back home the first time, I completely lost the video image. I could only get it back by turning back around so the rear of the F550 was facing my position and had to fly home backwards a fair distance (another advantage of a multi-rotor I suppose). As it turned out, in that upright position, the main body of the hex rotor was partially shielding the video RF from getting back to my receiver antenna. When I turned around to come home, the antenna was completely shielded by the body and I lost the image completely & immediately. The fix was super simple, I just rotated the antenna to hang below the aircraft and have had super clear video since. So just doing that simple little antenna move, more than doubled my video transmit range. The video I took below demonstrates the "null zone" several times as I fly directly overhead. To Sum Up Your FPV antenna decision making process as simply as possible. Pick your polarization type (likely circular). Pick your direction. Always omni for the aircraft; omni or directional for your ground station. Again I recommend beginners stick with omni directional for the ground station as well when first starting out. It's easy and inexpensive to get a directional later on if you want improved video range. 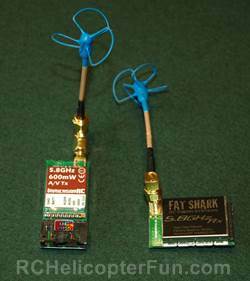 Ensure you get the right frequency antenna set for your FPV system (ie. 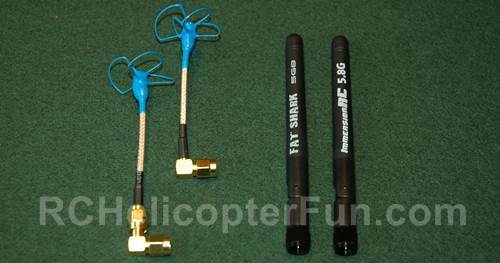 5.8GHz antenna set for 5.8GHz video transmitter & receiver). Hopefully that clears up the most common FPV antenna questions; but honestly, this just barely scratches the surface. I strongly encourage you to also watch Alex's two video's below to really get a strong base understanding of FPV antenna operation.